world through this site. Stay tuned, I've only just begun. heart! Lets hope this will be the first two videos of many more to come from Elisabeth! she wants to get even more muscular and stronger! including an APPLE with her BICEPS and her BARE HANDS!! few cans and plastic bottles with her biceps. 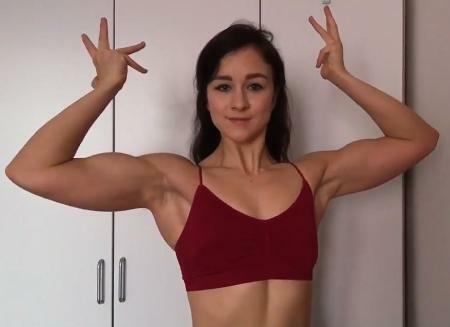 Truly incredible how a girl this cute can have biceps so powerful! knowing that she will be the strongest person in the club (boy or girl!). and pushes further than any athlete out there to one day be the strongest girl in all of Europe. Elisabeth thanks all her fans for their support and wishes all a very happy New Year. the site. Watch her video and you'll agree she never fails to wow us! proud to show off her perfect body and physique! beautiful muscle toned physique. Don't be scared, she's very strong and she'll won't drop you! athlete as she pumps and flexes her amazingly strong biceps and all-over perfect muscle!! her strength while proudly posing and flexing her jaw dropping super impressive physique! perfection!! Watch each muscle and vein pop as she caresses and oils her jaw-dropping biceps. She's one of the youngest models on the site with the most impressive muscle and physique!! power that can knock you out if you dare make her angry. loves to flex and the fans just can't get enough of this bicep muscle beauty! !